Cynthia Nixon attacked Gov. 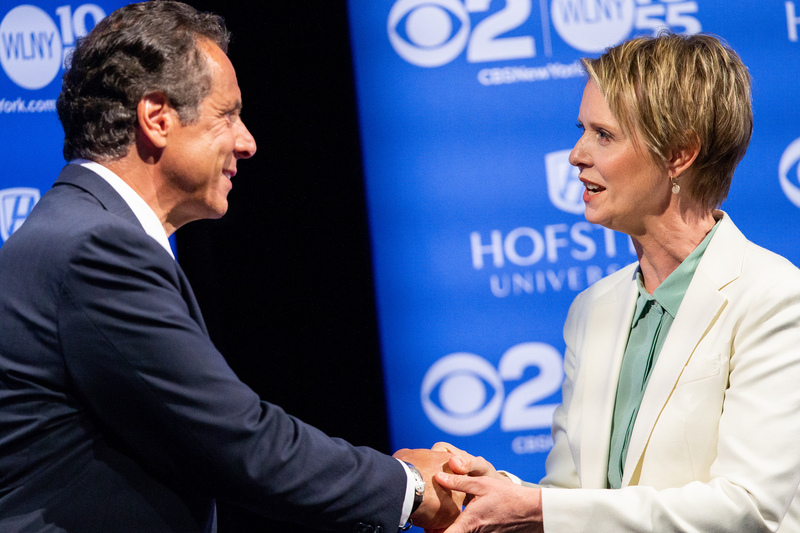 Andrew Cuomo as Cuomo attacked President Donald Trump during Wednesday night’s gubernatorial Democratic primary debate held at Hofstra University between the incumbent Democrat seeking a third term and his left-leaning opponent. Cuomo clapped back saying the governor of New York is not a job about “politics or advocacy” but about management — and, today, fighting Trump. Though Cuomo repeatedly returned to his anti-Trump, Washington GOP-focussed rhetoric, he vehemently stated he will not run for president in 2020 and said he is committed to finish the term if re-elected. “The only caveat is if God strikes me dead,” Cuomo said. Nixon only addressed Trump to attack Cuomo’s opposition of him. Nixon said that Cuomo stands up to Trump about as well as Trump stands up to Russian President Vladimir Putin. “We need to oppose Trump not just with rhetoric, but with policy,” Nixon added. She went on to criticize Cuomo for not passing the Reproductive Health Act in his eight years in office. The bill would secure abortion rights for New Yorkers if Roe V. Wade is overturned upon the appointment of a Trump nominee to the bench. Nixon also attacked Cuomo for not passing campaign finance reform measures, a promise he ran on in 2010 while campaigning for his first term, she said. Nixon questioned why the LLC Loophole, that allows donors to give to campaigns under an unlimited amount of LLCs, has not been closed. Nixon added that since taking office Cuomo has received more from the loophole than every legislator in Albany combined. “To say he was disincentivized to close it would not begin to explain it enough,” Nixon said. Cuomo reminded Nixon that “you need something called the New York State Legislature” to pass laws. “You don’t just snap your fingers and make it happen,” Cuomo said. However, Nixon attacked Cuomo for stacking the state Senate with GOP support through the Independent Democratic Caucus, a group of Democrats that caucused with the GOP until April. Cuomo also stated he would support canceling scheduled Metropolitan Transportation Authority fare hikes, but would not go so far as to say the state will pick-up the expenses except to share it 50/50 with the city. “If you want progress you need the city and state to both share fiscal responsibility,” Cuomo said. Nixon, who touted her frequent use of the MTA subway system, called it “unconscionable” that Cuomo is thinking of raising the fares on a poorly functioning system, ridden with delays. “He used the MTA like an ATM, and had seven and a half years to stop this avoidable crisis and he’s done next to nothing,” Nixon said. According to a New York Times fact-check, Cuomo had “steered money away from the system,” by using $5 million to assist struggling state-run ski resorts after a warm winter. Despite Cuomo’s claims that Nixon “lives in the world of fiction” and he “lives in the world of fact” where the subway system is owned by the city, the New York Times’ fact check said that the subway system is effectively within the governor’s control. Even on issues the candidates agreed upon, such as legalizing marijuana, they found reason to spar. Nixon said legalizing marijuana is a racial justice issue. “Effectively, marijuana in New York has been legal for white people for a long time and it’s time to make it legal for everyone else,” Nixon said. Cuomo noted recent results of a report he commissioned in January that showed the benefits of legalizing marijuana outweigh the risks. Nixon fired back that Cuomo only came out in support for legalization once her campaign pushed him left. Cuomo said he commissioned the report before Nixon was in the race. The winner will go on to face Republican Dutchess County Executive Marcus Molinaro in the Nov. 6 general election.